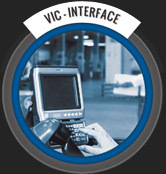 Visio Ing Consult puts all of its knowledge/expertise of processes and industrial flux at your disposal in order to offer you tools that perfectly adapt to your modes of working and operating. We pledge to provide optimal, stable, complete solutions. Turnkey system on PC, embedded PC or hand terminals :Creation of interfaces between the level N1 (automat, ...)and the level N2.Process management, exchange of messages.Human-machine interface (HMI).